Tuesday July 13th 1897 I did ironing and baking in the forenoon. Will went to town with a load of oats. Rob Whetstone was here for dinner. I was busy with the work most the afternoon. Wednesday July 14th 1897 I was busy most of the forenoon with the work. The boys were [resting?] in the hay. It began to rain soon after dinner. I wrote a letter to Laura Mason in the afternoon and fixed an old dress for myself. Thursday July 15th 1897 I had expected to go to town for the day but Will was not well so I would not go away. He went down to cut oats after dinner and did not come home till night. Callie spent the afternoon with me. Friday July 16th 1897 I took an early start to town. I was busy about town till nearly noon when I went over home for dinner. Ida & Nellie are here. I came home early. The men cut oats. 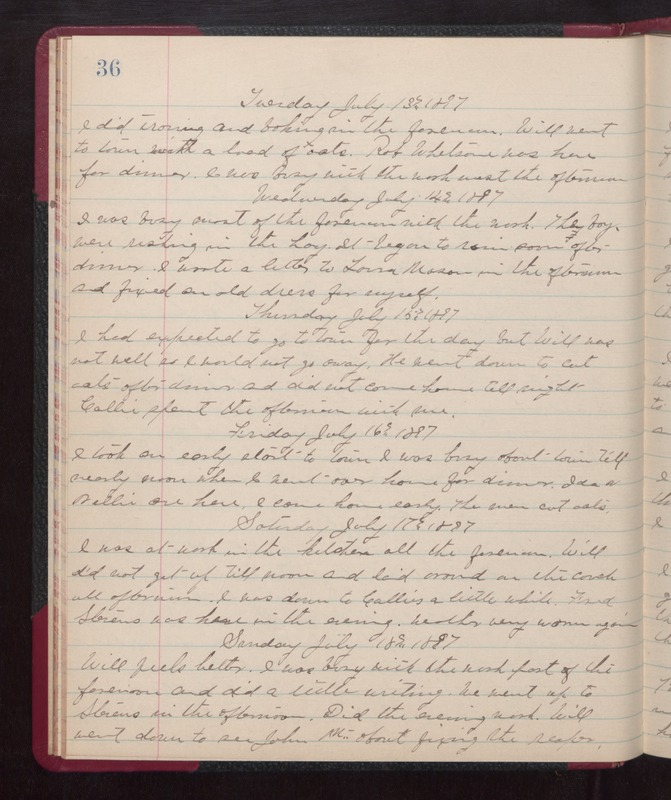 Saturday July 17th 1897 I was at work in the kitchen all the forenoon. Will did not got up till noon and laid around on the couch all afternoon. I was down to Callies a little while. Fred Stevens was here in the evening. weather very warm again. Sunday July 18th 1897 Will feels better. I was very busy with the work part of the forenoon and did a little writing. We went up to Stevens in the afternoon. Did the evening work. Will went down to see John Mc-- about fixing the reaper.